Roger Phillips was born in New York City in 1930. His education as a metal smith began on Long Island at age 12 as a blacksmith’s helper. He has worked in metal ever since. His first exposure to art was at the Woodstock Country School in Vermont where he studied with Francis Foster, a teacher from Black Mountain College who ran his classes on the Bauhaus model. Phillips graduated from Bard College in 1953. He studied drawing and design at the New School and metal fabrication at the Jewish Museum in New York. He is a past president of the Artist-Blacksmith’s Association of North America. His studio/workshop is located in Stuyvesant, New York about 100 miles north of New York City. A constructivist, Phillips is in private and public collections throughout the United States. A large portion of his work is kinetic, made of stainless steel and brightly painted aluminum plate. Many pieces are commissioned for specific outdoor sites. Smaller versions, suitable for the interior of a house, of some of Roger’s sculptures have been produced in limited editions. The beauty of Roger Phillips’s sculpture is experienced as soon as you see it. Simplicity and purity are achieved through meticulous engineering and craftsmanship. His vision is elegant, positive and decidedly upbeat. His own words reveal the inner spirit of the work. Several influences are obvious: the bright forms, although more geometric, are reminiscent of Alexander Calder; the smoothness of motion plays homage to George Rickey; and the dialogue between graphic and three dimensional work refers to Ellsworth Kelly. Various kinetic sculptors use slightly different methods to create motion: in Calder’s work the moving elements are attached from the top, Rickey’s are pendulums, Tim Prentice uses ballast, Lin Emery connects at the bottom and Pedro de Movellan sometimes uses magnets. Each produces a different effect. In contrast, Phillips has the moving elements held at top and bottom so each moves in a 360-degree orbit around a vertical axis. There is a provocative contrast between the rigidity of the frame and the fluidity of the moving elements. The moving parts seemingly disappear and reappear as they revolve, revealing the surrounding landscape through the negative space. The sculptures appear light and airy as their glossy colored surfaces reflect their natural surroundings. Red Figure Eight is a unique and intriguing sculpture creation for Roger Phillips. 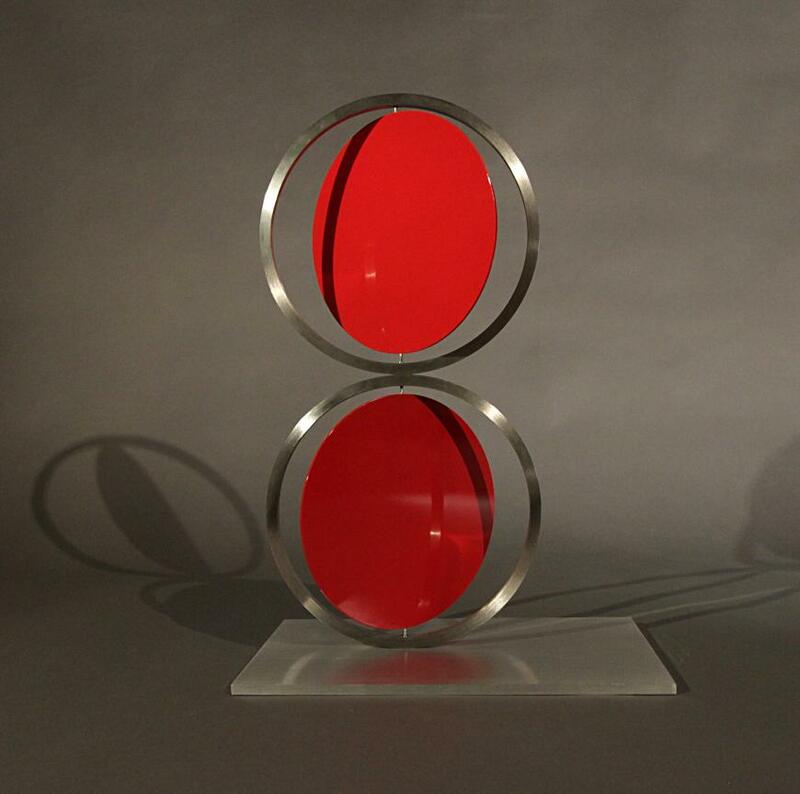 Unlike many of his sculptures which boast strong lines and geometric forms, Red Figure Eight is more organic, sporting rich stunning white circles. What does remain a constant through all Phillips’ sculptures, however, is the careful crafting of the brilliantly colored shapes dressed in protective automotive paint. There is still a sense of order and yet also one of playfulness. Who can resist the temptation of spinning these simple yet meticulously engineered circles that move kinetically and thrill both the eye and the touch of the viewer? The complete lack of pretension appeals to the inner child in all of us—young and old alike. There is a provocative contrast between the rigidity of the frame and the fluidity of the moving elements that seemingly disappear and reappear as they revolve, revealing the surrounding landscape through the negative space. In motion the sculptures appear light and airy as their glossy, colored surfaces reflect their natural surroundings.